PARANORMAL STATE’s second season debuts tonight on A&E and I just can’t help but take a few paragraphs to remind myself—and anyone who cares to listen—just how stupid this show is. 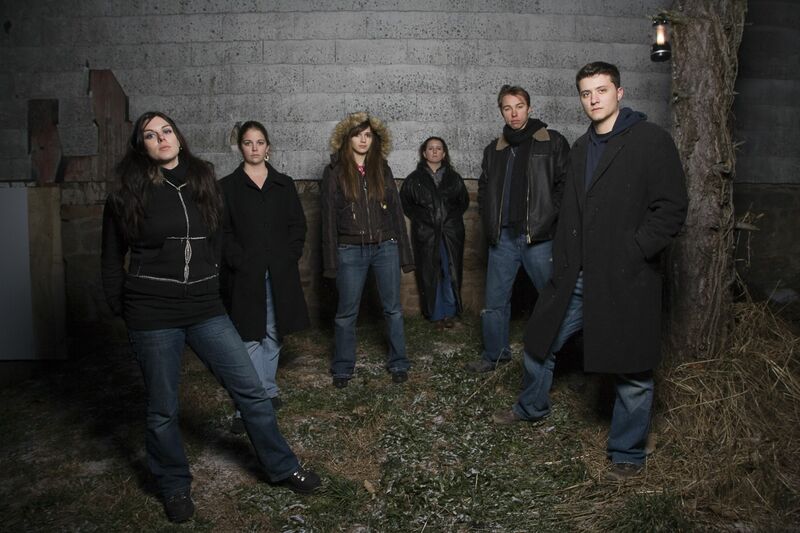 I was on the official A&E Paranormal State website and came across mini-biography videos of the PRS team members. Some disclosure: I was a member of a student organization for four years and we had all kinds of silly traditions which in turn fostered a very nice sense of kinship. Watching the PRS bios, I got that same sense that these people were mainly just looking for a community where they felt like they could pursue their interests. Season two introduces some new members to the group (specifically, two cute girls) who laugh and complain about having to take a 2 hour class every week on the paranormal. Yikes! Granted, my student org was a pretty big time commitment too, but we were not ruled by fiat nor did we have any kind of executive member teaching classes and running everything. PRS, however, is run by Ryan Buell who I have critiqued earlier. Buell (“Anyone? Buell… er?”) takes PRS very seriously. We can tell this because he shouts at people over the phone demanding information and dresses up like Fox Mulder. I, however, do not take Ryan Buell very seriously. Take for example this video of Ryan describing his first paranormal experience as a kid (age was not specified). I was on the top bunk. I saw like a four foot scary looking troll/demon… very wide grin and you could see its teeth they went like all the way up here to here. That’s right! Atog from the Antiquities Magic the Gathering expansion IS REAL!!! AND HE HAUNTS RYAN BUELL!!! Now can I prove that Ryan is really just mis-remembering a stupid Magic the Gathering card? Well, no, but as one PRS member states: “There won’t be 100% proof, but there will be 100% faith.” So I guess if that’s good enough for them, it’s good enough for me. 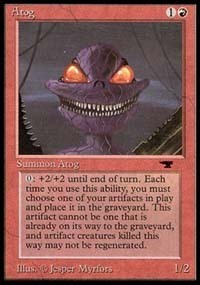 So my evidence is circumstantial, but I’ll add that Atog remains one of the most distinctive and popularly known cards in the Magic series. Also, Ryan was 24 at the time the video was shot. So while we don’t know what age “young” was for him, we can guess that he would have been mature enough around the time that the Atog card was originally released (1994) to remember it, and even if he wasn’t, Atog was so popular that it was reissued several times. Of course, the real question will be whether Wizards of the Coast sues Ryan over the use of Atog in his paranormal fantasies. But my sniping aside, I’d just like to remind anyone who cares that the central problem with PARANORMAL STATE is that it uses all the gadgets and gizmos of technology and science to attempt to attain hard evidence of the paranormal. Of course, they have yet to succeed, but that doesn’t stop them from creating the air of success. It’s the same duplicity used by Intelligent Design advocates: use science to “prove” that which is inherently unscientific. It’s deceitful and potentially harmful. If Ryan and co. would admit that what they’re doing is just a fun way to get together with friends and play with gadgets and tell ghost stories I’d be all for them. But then of course they wouldn’t have been on TV and I never would have heard of them. I’d be fine with that too.